Our Greek Thermae Spa Centre allows you to enjoy some much needed `you time` in the infra red heated sauna to relax those aching muscles. Let the various fragrances in our new steam room float over you and help to detox the whole body. The hot tub is as relaxing as it is invigorating especially whilst indulging in a glass of bubbly in the bubbles. Refreshing face towels with iced orange water are on hand to cleanse and invigorate your skin and leave it silky soft. You can then luxuriate in a warm shower before snuggling into a fluffy gown which we provide, along with flip flops for wearing outdoors should you wish to explore the lake, wooded ‘henge’ and 4 acre small holding. 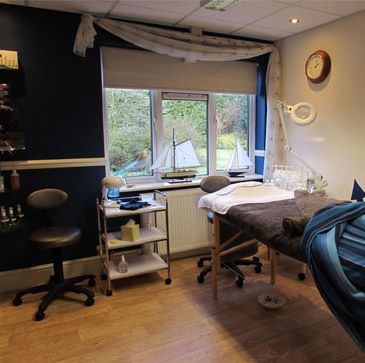 You can choose from a wide range of treatments as part of your special package. A light lunch and refreshments are included. On arrival you will be welcomed with choice of tea, coffee or soft drink. We have a fully licensed bar so you can opt for Bucks Fizz or Summer Punch to enjoy while soaking up the relaxed atmosphere in the hot tub; all you have to do is lay back and allow your body to be gently massaged with the water jets and bubbles. Why not treat your loved one with a gift voucher to celebrate a special occasion, such as an anniversary, birthday or forthcoming wedding. What better way to make someone feel very special?